It’s been quite some time since I’ve done a Five on Friday, so I figured I should join in on the fun this week... linking up with April to celebrate! When John and I were in New Mexico recently, our friends introduced us to Vinho Verde wine, and I have since become a little bit obsessed. I’m not a white wine kind of person, but this wine is fabulous! And the best part? It’s cheap! At only $7/bottle, it’s a perfect pool wine to drink in the Arizona heat (something just doesn’t fit drinking red wine when it’s hot out!). John and I were doing so great with meal planning the past few months, but have recently fallen off the bandwagon! I swear, all it takes is one Sunday that we don’t grocery shop, and we fall out of the rhythm for the next few weeks. 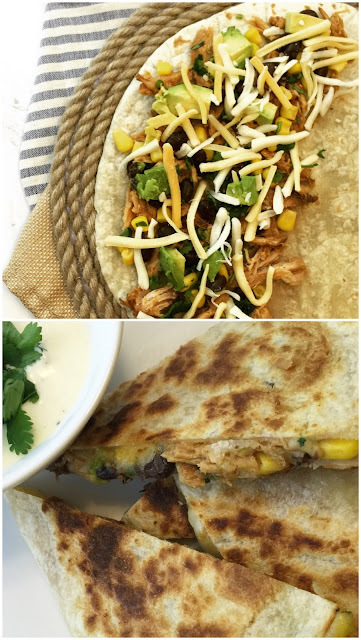 I was rummaging through my refrigerator and was trying to find something to make, and we had all the ingredients for Southwest quesadillas... and they were fabulous – a perfect twist on a simple meal! Simply layer pulled pork, shredded cheese, corn, black beans, avocado, and cilantro in a tortilla and heat in a frying pan until hot and the cheese is melted. Serve with ranch dressing or salsa, and you’ve got yourself a simple and tasty meal! Has anyone baked with protein powder? My coworker has this cookbook, and some of the recipes look so tasty! Think banana bread, but with a ton of protein (from using banana flavored protein). I’m kind of intrigued! John and I leave for Europe on Wednesday, and to say we are excited would be a huge understatement. 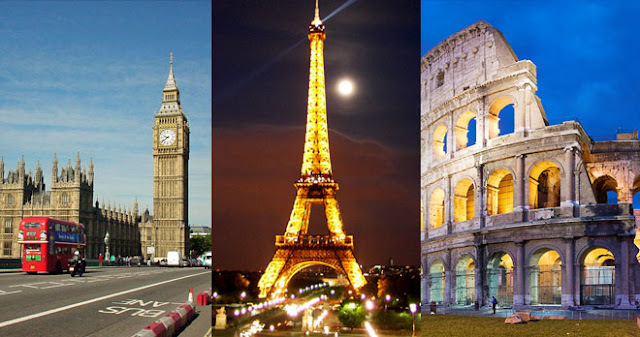 We will start in London, head to Paris, and finish in Rome. We have tours booked, restaurants picked out, and are looking forward to exploring the cities! If you have any last minute recommendations, please let me know! I just bought a pair of Birkenstock Gizeh, and I'm basically super excited about them. I pretty much live in flip flops during the summer, and I wear through them so quickly. This will be a perfect compromise between a good looking flip flop while still being durable and comfortable! We cook with protein powder all the time!! They are perfect in pancakes or waffles. My husband makes "protein pancakes" that are pretty yummy! A trip to Europe?? Exciting! Have an amazing time on your trip! Buon Viaggio!!! What do you want to know about Rome? I have spent large chunks of time there and have close family there! those quesadillas look amazing! :) and have the BEST time in europe (buy your Colosseum tickets online to skip the major line!) ! love those birkenstocks too...those shoes are so comfy! EUROPE?! Oh, please take me with you!!!! ;) Caleb and I were doing pretty good w/ meal planning but have since kind of pulled stuff together at the last minute. I so prefer planning ahead!! Ummmmm, I was trying to avoid Birkenstocks and every time I would see them on someone I would think, "Stop trying to make Birkenstocks happen. They aren't going to happen." Then I just googled the pair you bought and I am going to buy them I think. They are super cute. How did this happen? White wine is my go to drink – I will be checking that out very soon! Those quesadillas – yes! You have me craving one for lunch maybe now. Enjoy Europe – that will be amazing! Have a great trip! Can't wait to see the posts about it! I see where people use protein powders for pancakes & muffins & I'm always like, WHAT?!??! I didn't know there was a cookbook for it. Mmm I'll have to try the wine! And love Birkenstocks! Ok, I think it's time I break down and buy a pair of Birkenstocks before summer is over! Safe Travels. I have recently started to add protein powder especially with breakfast bars etc! Go read my post this week on night photography!!!! Have an amazing trip! Can't wait to see your photos!!!! Oh man, those quesadillas look delicious! Have so much fun on your European adventure! Can't wait to hear all about it and see pictures! I can totally relate to the meal planning thing. Why does it take so long to get back on?! And I'm so excited to hear all about your trip to Europe! I hope y'all have the best time!